Author(s): Domański B., Gibowicz S., Wiejacz P.
Empirical Green's function deconvolution technique was applied to retrieve the source time functions from the records of P waves from 17 seismic events that occurred in 1996, 1998 and 1999 at Rudna copper mine in Poland. The events were located within the underground seismic network composed of tens of vertical sensors situated at a depth of about 1 km; the size of the network is about 10 by 10 km. Their moment magnitude ranged from 2.1 to 3.3. The records of smaller events from the same area and with similar source mechanism (based on moment tensor inversion), with moment magnitude ranging from 1.5 to 2.4, were accepted as empirical Green's functions. The relative source time functions were retrieved by the classical deconvolution in the frequency domain and by the projected Landweber deconvolution in the time domain. The Landweber approach is an iterative technique allowing introduction of physical constraints (positivity, causality, finite duration) on the final source time function. The relative source time functions retrieved at several stations by both methods are quite similar, although the Landweber deconvolution provides more objective determination of their duration. The relative source time functions display directivity effects in 15 cases, implying unilateral rupture propagation in the source. The direction of the rupture propagation and the rupture velocity were estimated from the distribution of pulse maximum amplitudes as a function of station azimuths. The rupture velocity is variable, ranging from 0.3 to 0.9 of the shear wave velocity. The source pulse widths is considerably smaller than the reciprocals of the corresponding corner frequencies. Consequently, the source dimensions, represented by the fault length, are smaller than those estimated from seismic spectra, ranging from 75 to 550 m.
The focal mechanisms of 61 seismic events were determined using the seismic moment tensor inversion method. All the tremors were induced in 150-meter zone of Kłodnicki fault in Halemba coal mine area. Dominant double couple component was noticed for majority of the tremors. On the basis of focal mechanism solutions, mean local stress tensors for groups of twenty events were calculated. The study revealed significant variations of the local stress field, manifested by interchanging of the positions of main stress axes. Author(s): Kalenda P., Skalský L.
The LURR (load-unload response ratio) theory (Yin et al., 1995) was verifield in the Ostrava-Karvina Coal Basin (OKCB) mines. The theory is based on the influence of tidal forces on the rock mass. The rock mass in normal conditions does not show the difference between the seismic activity in the load and unload phases of tidal variations. In the breaking stress conditions, the seismic activity rises much more during the load phase of tidal variations, which leads to the rise of the LURR coefficient value before the main event (Yin et al., 1995). The LURR theory was tested in the areas of coal blocks with a high seismic activity and well-localised foci of seismic events. It was found that the tidal forces influence the seismic activity, but the phase shift varied from coal face to coal face. The phase shift varied in the area of one coal face depending on the height of the seismogenic layer above the mined-out coal seam. Finally it was found that LURR coefficient could not be used in induced seismology in the same manner as in global - not induced - seismology because seismic activity depended mainly on the time and intensity of coal excavation, which implied that the LURR coefficient varied according to the shift between excavation and tidal variations cycle. In the conditions of induced seismicity, coefficient b of energy-frequency distribution can be used instead of LURR coefficient. The disadvantage of b coefficient is its variance related to the strength and strain and a high number of events, necessary for its evaluation. Applying a simple rheological rock model with elastic-brittle field and assuming small inelastic strains, approximate linearized theory of (seismo)acoustic emission for a longwall with a shearer can be formulated and linear state-space equations can be stated with emission activity or energy as directly observed information carriers. To a first approximation, emission-generating longwall appears then th be a linear system with the product c·σ(t)·V(t) (where V(t) is the shearer velocity and c·σ(t) is a quantity proportional to the local stress) acting as an input (forcing) function. As the contemporary control systems allow us to observe the V(t), the state-space equations can be sequentially - according to incoming observations - solved for c·σ(t) values. The results can be used for local, along the longwall face, estimation of seismic hazard changes. Author(s): Brož M., Málek J., Růžek B., Horáček M.
The underground gas storage was built in 1998 near Přibram, Czech Republic, at a depth of 1000 m. A seismic network has been established in the area in order to monitor local seismic activity. 187 seismic events up to magnitude 1.7 have been registered since August 1998 (Fig. 1). The epicenters of the shocks form a narrow belt along the principal geological fault in the area. The depth of the hypocenters is from 0.3 to 1.9 km. Mechanisms of the strongest events were computed (Fig. 2). The nature of the shocks is not definitely clear yet. In our opinion, the primary reason for generation of seismic events is the tectonic stress affecting the geological fault near the gas storage, but the individual shocks are mainly accidental destruction of previously made cavities. Releasing of the seismic energy is triggered probably by the rising groundwater level. In seismological observational practice seismic signals are very often obscurred by a strong seismic noise. Sometimes one needs to have only a very limited knowledge on them, and sole information on the presence of a seismic signal is quite important. Some of such situations include e.g. seismic source location, where only an onset time is needed, or the situation of monitoring the seismic activity. Below we will concentrate on the really difficult cases, when a visual inspection of a trained seismologist fails to find and hint of the presence of a seismic signal on the noisy seismograms. The difficult task of the signal detection can be done by a neural network. As the input data we will use the autoregressive parameters, which model the seismogram. Application of wavelet transform method to seismic signals from coal mines for the purpose of approximating noisy signals and detecting the P phase arrival was shown (Fig. 1). The wavelet transform is a very useful tool in the analysis of nonstationary signals such as a seismic signal. It allows us to resolve features of the signal at various scales. At each scale we can observe an approximation and details (low-frequency, and high-frequency) components of the original signal (Fig. 3). The process of this decomposition has tow stages: decomposition of the original signal into approximation and details coefficients and then reconstruction of the approximation and details (Fig. 4). To do so, we use two pairs of filters associated with wavelet and scaling function (see Eqs. 9 to 13). What is interesting for us, is that the details at finest scales contain noise (Fig. 5), which can be suppressed by thresholding the wavelet coefficient using soft or hard thresholding (Eqs. 14 and 15). The noise suppression results seem to be better than those of the traditional low-pass Butterworth filtering (Fig. 7). Because we do "amplitude denosing" instead of frequency denoising, we can suppress also low frequency noise (by thersholding the details coefficients at lower scales). The P phase arrival detection can be done due to observation of the increase of the value of details at the moment of P phase arrival (Fig. 6). We can gain this effect by multiplying details at few scales (Figs. 8 and 9). Author(s): Kaláb Z., Knejzlík J. Results of experimental measurement of effects of mining induced seismicity in the Ostrava-Karviná Coal Basin (Czech part of the Upper Silesian Basin) are discussed in the present contribution. The aim of this measurement is to evaluate an influence of seismic events on buildings because many inhabitants reside in the area affected by such a load. Seismic sensors were installed usually on basement of a selected building to enable measuring of source forces that had induced vibration of the monitored building. In general, seismic effects of mining induced events did not cause and extraordinary dangerous conditions from a civil engineering point of view. The strongest events, however, can evoke unpleasant feelings of residents. 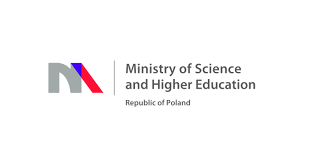 Author(s): Orlecka-Sikora B., Lasocki S.
The work presents results of studies of seismicity from the Legnica-Głogów copper district. Data for the analysis were taken from seismic catalogs of Polkowice-Sieroszowice, Rudna and Lubin mines for the period 1975-2000. A spatial distribution of epicentres was examined and seismic clusters were identified. Events that did not have explicit location parameteres in the catalogs were included into respective clusters, based on location of mining regions they belonged to. Having done the spatial division of events, their temporal distribution within every zone was studied in order to determine duraiton times of the zones. For each of the spatial-temporal seismic zones obtained in this manner we estimated its specific characteristics, namely, the activity and energy distributions. The results show that the maximum credible energy in the studied region tends to increase along the SW-NE direction, which is equivalent to an elevation of potential seismic hazard in this direction. The results of these studies form the basis for probabilistic hazard an alysis of the region. Author(s): Čápová D., Kaláb Z. The first task of investigators studying large amounts of data obtained using different scientific methods is to transform this information so that it can be treated as a unified data base. It has now become possible to use powerful PC software and data processing to build an effective Geographical Information System (GIS). Special geotechnical and geological parameters are responsible for mining-induced seismicity. In regions affected by this problem, the factors which must be taken into accounts include open voids in abandoned mine workings, areas subject to active undermining, changes in stress-strain conditions in the country-rock, sites with extreme geomechanical conditions, the effects of mining activities at the surface and the impact on the local environment. This complex of factors requires an interdisciplinary approach to the input of data and the design of tools for map presentation which takes account of the complicated structure of the database. The first stage of the project "Influence of underground mining damp-down on processes in the lithosphere and environment" is to prepare and integrated database using best contemporary methods of data management. The methodology by which this problem is to be solved using GIS approach is the subject of this contribution. Author(s): Holub K., Rušajová J., Holečko J. The induced seismic activity of Ostrava-Karviná coalfield (hereafter only OKR) resulted mainly from mining activities within its eastern part. This part of the coalfield became a center of general interest of long-term seismic observations and less attention was paid to seismic activity of other outer parts of the coalfield. One of such areas is the southwestern part where the mines Stařič and Paskov are located. Since 1990, induced seismic events have been detected by stations of the regional seismic polygon of OKR (hereafter SP) and since 1992 also by stations of the Frenštát network (hereafter SPF). Some events were recorded by seismological stations of Vranov near Brno (VRAC), Moravský Beroun (MORC) and Ostrava (OKC). All these seismic events were located to mine fields of Stařič and Paskov collieries. Between February 24, 1990, and May 11, 2001, forty seismic events were detected and located there. The time series of recorded events and their focus plots provide new information related to focal zone which has not been investigated in detail yet. Underground exploitation is a process varied in time. These variations cause the time changes of probability of strong event occurrence. This can be seen in seismic source distribution that tends to concentrate in the active mining regions. Some ordering of the epicentre distribution around a place of the future main event is expected. Recently, the statistical analysis methods are often used to verify the character of variations in time of the seismic source distribution. The course of a process, e.g. the mining event generation process, can be controlled by statistical quality control methods. Generally they let us observe whether the process descriptors fall within evaluated bounds. The process out of control in several points means that the process course has changed anomalously or an influence of another significant factor has occurred. Using quality control methods to monitor the behaviour of epicentre distribution parameterizations should enable to indicate preparatory process leading to a strong mining event. We select the statistical and fractal parameterizations of seismic sources distribution for these studies: the directional angle of the temporary linear trend of epicentres, the root-mean-square dispersion around the trend and the difference between two correlation dimensions. 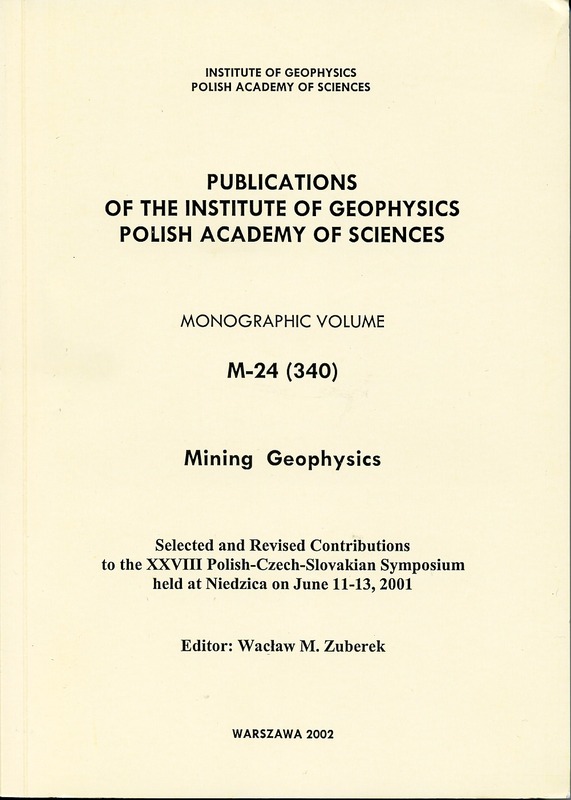 Studies were carried out on seismic series from Polish coal and copper mines. Author(s): Buben J., Rudajev V.
Assessment of earthquake hazard to building sites for extraordinarily vulnerable objects is based on prognoses of the seismic potential Mm for all known earthquake source zones and on the empirical functions describing the decay of seismic ground vibration with the epicentre distance. In the seismic-tectonic conditions of the Czech massif no such empirical relation exists because of missing instrumental records of strong earthquakes in the locality and region. Therefore, the application of relations from abroad has been inevitable up to recent years, when some first authentic records were obtained by making use of local seismic networks. This paper deals with testing of the reliability of some formulae known abroad for the conditions of the Czech massif. Testing data are obtained from earthquakes in the near region as well as from mining induced microtremors and rockbursts in the Lubin copper mine. Author(s): Buben J., Brož M.
An experimental pickup system for torsion component of seismic ground particle motion rate was constructed using mechanical systems with fly-wheel axis on ball bearings. The possibility of using two current systems was examined. The first one is DEPREZ, i.e., a system of analogue voltmeters, and the second one was obtained as the electro-mechanical component of a PC hard disc. Laboratory experiments have proven that the influence of dry friction on such seismographic systems is acceptably low. A system for recording the torsion components of seismic waves from tectonic as well as technical sources is being prepated. The work presents a system for network monitoring fo ground vibrations, base on Internet technology. The system, making use of present feasibilities of telecommunication, conducts automatically and practically maintenancelessly recording of seismic vibrations at any number of measurement points. The access through a WWW utility to a recording database, equipped with handy and flexible functions for visualising, selecting and editing, and maintained in the Central Measurement Base - the system's server, is independent of mutual locations of Recording Stations, the Central Base and a user's computer. Thanks to implemented solutions, SEJS-NET system, supporting routine processing of collected data, builds at the same time a simple and flexible ground for advanced processing. Author(s): Knejzlík J., Kaláb Z. Digital seismic signal recorder PCM3-EPC equipped with embedded PC and data telemetry via GSM modem was designed by the Institute of Geonics of AS CR for application at three-component surface seismic stations established in the Ostrava-Karviná coalfield to study and influence of mining induced seismic events on surface structures. A block diagram of PCM3-EPC as well as its main parameters are described. A lot of work to discover and document Zn-Pb ore deposits has been done for 30 years in Silesia-Kraków region. Among well-recognised deposits only few ones, such as Klucze or Zawiercie "I", have fulfilled some conditions as to the quality and resource criteria. Zn-Pb ore resources being exploited at present (e.g. in Pomorzany mine or Trzebionka mine) have already been depleted in great part and it is predicted that mining activity will have been finished there by the year 2006. However, taking into account the economic aspects, e.g., low price of metals and high price of production, it seems unprofitable to invest in building a new mine. Author(s): Ćmiel S., Idziak A. The aim of the present study was an application of coal optical property measurements for analysis of structural development of the Kłodnicki fault zone - one of the main tectonic discontinuities in the Upper Silesian Coal Basin (the USCB). Optical properties of vitrinite depend on physical conditions during coalification; therefore , it is possible to determine the process of coal basin development basing on reflectance anisotropy measurements. Measurements of vitrinite reflectance were carried out on six coal samples. Four of them has been taken near a hanging stope of the Kłodnicki fault in coal fields belonging to the Wujek mine and Staszic mine. Two other samples had been taken on opposite stopes of the Krzyżowicki fault in mining area of the Pniówek mine. Vitrinite reflectance measurements were done using a petrological microscope with linearly polarized light source. Maximum and minimum apparent reflectance values (R'max and R'min) were measured. Vitrinite anisotropy was described by Reflectance Indicating Surface (the RIS) which was a geometrical representation of the optical anisotropy tensor. The presented study shows the usefulness of coal reflectance measurements in the analysis of paleostress field existing during the forming of coal basin when coalification process continued. The seismic tomography - a special way of seismic radiography processing - makes it possible to obtain the results of essentially better quality than in the classical ways of seismic proceedings. The curved rays technique gives more credible information than the straight ray method. One of the important assets of the seismic tomography is obtaining information from places between profiles, i.e., the places that cannot be penetrated into with other geophysical measurements. We can judge which changes occur in the rock massif between separate measurements stages by using the repeated radiography and its tomography processing. Examples of the results of a single-shot (unrepeated) mesurement for determining rock massif failure caused by building of a pumping power station will be given. An example from the repeated measurements for the investigation of rock massif changes by preventing blasting will be demonstrated too. 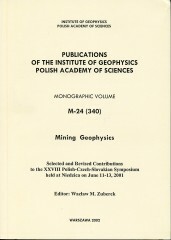 Author(s): Živor R., Klos P., Pechoč J., Brož M.
The effect of mining on the surface of the Mayrau Mine shaft pillar within the Kladno coal district, drawn in 1993-1997, is assesseds in this paper. This has been carried out on the basis of the results of levelling measurements of surface objects. The maximum surface subsidence during the period 1993-1999 was found to be 0.44 m. The maps of rates of annual surface subsidence in 1994 to 1999 have been plotted. The rate has been gradually decreasing since then. In 1999 the maximum rate of surface subsidence was only 0.045 m per year. No damage to surface objects was recorded. The mining activity within the Mayrau Mine shaft pillar was terminated in 1997 and the mine was closed. An open-air mine museum is now being built using the unique technical monuments of the former mine. In this paper there are presented results of seismic refraction measurements realized on the surface in the period of about 2 years in the area above the longwall underground mining. Velocity and attenuation coefficient of head waves have been analyzed and correlated with surface subsidence. Observed variability seems to be logical and consistent with the process of subsidence through development. On the basis of obtained results it is concluded that the process of rock mass deformations due to underground mining generates measurable changes of propagation velocity and coefficient of attenuation of seismic head waves. Author(s): Pierwoła J., Jochymczyk K.
Constructing highways in underground exploitation regions is difficult because mining and phenomena related to it, like induced seismicity, are always connected with surface subsidence. Therefore, it is interesting to check if there is any relation between the mining tremor occurrence and surface subsidence in case of coal longwall extraction. For such an analysis the area of the Katowice-Kleofas Colliery has been chosen. An excavation has been done below the A-4 motorway under construction. The subsidence had been measured periodically since 1999. All tremors with energy ≥ 1∙102 J have been selected from the catalogue of the coal mine. Up to April, 2001, the surface came down more than 1 m and more than 6500 tremors have appeared. This paper aims at presenting the calculation of the second rank tensor of the electrical conductivity for four-layer geoelectrical model. The geoelectrical model was obtained from the interpretation of azimuthal measurements of apparent resistivity of rock mass. The measurements were carried out during the forming process of the subsidence trough over the longwall mining. All geoelectrical layers were assumed as a transversely isotropic medium. Author(s): Markowski E., Kornowski J., Zuberek W.
After a few years of seismic monitoring on the surface of the Bytom Coal Co. (BSW S.A.) region, some conclusions on the seismograms, their spectra measurements and amplitudes can be formulated. On the average, amplitudes are attenuated with distance, as expected, and higher frequencies are attenuated faster, but relations are highly variable and sensitive to local conditions. About 99% of wave field energy (measured as integrated squared particle velocity) occurs below 20 Hz, so if we are interested in seismic energies only, a sampling frequency of 60 Hz seems to be adequate; however, for nearby sources, significant acceleration amplitudes above 20 Hz are observed and if they are of interest, a sampling frequency above 100 Hz is advised. From the whole set of observations, events of energy 2∙105 J have been selected and maximum acceleration amplitude versus distance relations have been analysed. In the observed epicentral distance range (400-200 m) the maximum acceleration amplitude decrease can be described by linear relation. Author(s): Porzucek S., Leśniak A. The essential problem in mining and postmining areas is the location of loosened zone which affect the Earth surface. The best geophysical method suited for this problem is microgravimetric measurement. Evaluation of the surface position of these zones is not a problem nowadays. The most complex is the evaluation of their depths. In the paper, a new interpretation method developed for this purpose called the Euler deconvolution is presented. Author(s): Madej J., Jakiel K., Porzucek S.
The paper presents the abilities of the microgravimetric method to estimate a degree of backfilling in small inactive post-mining shafts and skylights of sthe drainage drifts for the mining fields of zinc and lead deposits in the Olkusz area. The accurate estimate of this degree depends on the accuracy with which the distribution of gravity microanomaly is determined. Specific morphological conditions and diverse geological structure of the top-layered rock mass in the Olkusz area required analysis the influence of topographical correction of gravity and bulk density of the rocks forming the reduction layer, upon the calculated microanomaly values. From among 59 thoroughly examined small shafts and skylights within the Bolesław, Bukowno and Olkusz area, we have presented the results of the microgravimetric research into selected structures, documenting high potential of the method in assessing the degree to which they can be backfilled. Acoustic emission generated in cylindrical rock samples subjected to uniaxial compression has been monitored ulilizing both traditional parameter-based acoustic emission apparatus and DECI AESMART 2000 instrumentation. The latter apparatus is a unique new monitoring system which uses the plate wave theory as a theoretical background. It was designed to recognize the difference between AE signals generated by extraneous noise and cracks growth in plate-like specimens. This was accomplished by designing the transducer to be equally sensitive to AE signals generated by both the noise and cracks. The signals from this transducer are split into two frequency ranges (20 kHz - 70 kHz bandwidth, and 100 kHz - 1 MHz). The peak amplitudes of the signals in both frequency ranges are detected and the ratio of the high frequency (HF) to low frequency (LF) peak amplitudes is calculated. The value of this ratio can be used to determine if the source of the AE signal is an extraneous noise or cracks growth. The results obtained in present experiment have shown that, although the AE SMART 2000 instrumentation has been used under conditions such the plate theory is not applicable, measuring the ratio of high frequency amplitude to low frequency amplitude (HF/LF) can provide information on the behaviour of rock undergoing damage in compression. Author(s): Majewska Z., Mortimer Z. - calculation of Lyapunov exponents. The results obtained indicate that the AE induced by stress in the rocks studied exhibits the phenomenon of chaos. Among other things it was found that the temporal changes of correlation fractal dimension D2 and of the stress indicate a strong relationship and show how, as the fracture progresses, the AE process gradually evolves from a self-organized state toward a random state. The significant changes of D2 reflect the relative predominance of the two failure modes associated with rock failure under uniaxial compression (i.e. axial fracturing and shear failure). In the present study we consider two other AE parameters: time interval between AE events and the ratio of the high frequency (HF) to low frequency (LF) peak amplitudes of AE signal. First, the fractality of these parameters has been examined. Second, the temporal variations of their fractal correlation dimension D2 have been analyzed and compared with changes of D2 associated with single time series of the AE energy rate. It appeared that temporal changes of D2 coincided with stress relaxation in the rock. Author(s): Kwaśniewski M., Takahashi M., Li X. Samples of a medium-grained sandstone from Śląsk Colliery (Upper Silesia Coal Basin, Poland) were subjected to loading and unloading tests to/from different levels of differential stress (σ1 - σ3) in the pre- and post-failure stage under uniaxial compression (σ1 > σ2 = σ3 = 0), conventional triaxial compression (σ1 > σ2 = σ3 = p > 0) and true triaxial compression conditions (σ1 > σ2 > σ3 > 0). The conventional triaxial compression tests were carried out at confining pressures (p) equal to 12.5, 25.0 and 37.5 MPa. In the true triaxial compression tests the minimum principal stress (σ3) was equal to 25.0 MPa and the intermediate principal stress (σ2) was 1.5, 2 and 2.5 times higher than σ3. In all the tests, rectangular parallelepiped (cuboidal) samples of the dimensions 35 mm × 35 mm × 70 mm were used. The triaxial tests were carried out using the servocontrolled true triaxial compression apparatus (Fig. 1) developed by the second author, as a modernized version of Mogi's original design, at the Geological Survey of Japan (since April 2001, the National Institute of Advanced Industrial Sciences and Technology). In the triaxial cell of the apparatus, three principal stresses can be generated in rock samples indenpendently. The maximum and intermediate stresses are each induced by a pair of rigid pistons, while the minimum principal stress is induced by oil pressure. Results of investigations into electromagnetic emission from rocks (collected from mines in the Lubin Basin) observed when the latter are crushed are presented. This phenomenon occurred in the case of all the rock samples and for some of them electromagnetic radiation was observed also at non-destructive loads. The electric field and the magnetic field of the emission were recorded and the spectral distributions of the respective fields were determined. The two fields differ in their intensity and spectral distribution. Also the tested kinds of rocks differ in their radiation intensity and spectrum. The research is to be continued. Author(s): Cyrul T., Majewska Z. We present results from experiments performed on three rock types, in which acoustic emission (AE) was monitored simultaneously with stress and strain as samples were deformed in uniaxial compression. Samples of each rock type were loaded uniaxially under constant circumferential strain rate using the Instron 8500 stiff testing machine. The strain rate used in the tests was equal to 10-6 s-1. This mode of loading results in well defined post-failure region of stress-strain curve. Some information about the processes taking place in rock from initial load application to complete rapture of the sample might be extracted by the combined analysis of AE data and complete stress - strain curve. Fracture behavior of rock sample in the post-failure region can give useful information on the mechanisms of rock failure. Wawersik identified two types of post-failure behavior of rocks under compression termed as class I and II. Although a considerable number of studies of AE in rocks under stress have been carried out, they were concerned with AE generated during initial loading, through the linear elastic region, through the micro- and macrodilatancy stages into the ultimate strength. Until recently, there have been very few studies of AE in the post-failure region. Results from this experiment show that stress-strain curves indicate, according to Wawersik work, two classes of post-failure behavior. Distribution of AE parameters (AE rate, AE energy rate and the ratio of AE energy rate to AE rate) for samples classifield as class I and /or class II behavior show marked differences. The AE event rate and AE energy rate are positively correlated for class I samples. Changes of these two parameters for samples of class II do not go together. Furthermore, analysis of an amount of AE generated within each stage of sample deformation shows diversity. It appears that investigations described can be of value in predicting rockburst hazard. Author(s): Veverka J., Vilhelm J., Rudajev V., Lokajíček T.
Granite rock samples of cylindrical shapes were uniaxially loaded. Experiments were carried out at four different loading rates. The time of start loading to final rupturing varied in four orders, 10, 100, 1000, 10000 min., respectively. Measurements were carried out on a special rheological press where - in addition to ultrasound emission - relative deformation was monitored as well. For ultrasonic emission (UE) the 6-channel equipment was used (up to 1 MHz frequency). The areas of higher number of events (several hundreds) were determined by ultrasonic emission source location. It has been found out that in short-term experiments the foci of ultrasonic emission processes were spatially distributed in a random fashion. With declining loading speed, foci tend to be clustered in space, their position indicate the formation of areas of future rupture. Author(s): Bláha P., Müller K.
The repeated geophysical measurements are or should be part of the geotechnical monitoring which broaden the knowledge of the rock massif behavior. The seismic, radiometric (radon) and geoelectrical monitoring is being used. All these investigations enable to determine and judge dangerous and critical conditions in the rock massif or in artificial objects. Besides these typical monitoring services, we can use a great number of the repeated geophysical measurements (gravity, magnetic, seismic, geoelectrical and well logging) for the stress-strain changes observed in a rock massif and for the ground water dynamic determination in rocks. In our paper wew illustrate several case stories of using geophysical monitoring in the geogtechnical practice. Some results of geological engineering research carried out for road tunnel planning in Carpathian Flysch in Laliki near Zwardon have been presented. To construct the physical model of rock mass, it was necessary to make the recognition of geological structure and its physical properties. The geological structure was estimated on the basis of cartographic data, geological mapping, geophysical measurements, borehole drillings, and trenches. Physical properties were determined on the basis of dilatometric and water pressure tests, and laboratory tests of soil, rock and water. In the next stage, the achieved results are used to determine the geotechnical model of rock mass, necessary for tunnel construction calculation. The work presents a possible scheme for determination of geotechnical model for tunnel projection in the Carpathian Flysch. The basic stages of this procedure were described: an analysis of main features of the rock mass, properties correlation, rock mass layers classification and finally calculation of geotechnical parameters. The presented example refers to the research carried out for road tunnel in Laliki (the Carpathian Mountains, Southern Poland). This work is a continuation of researches related to the recognition of geological-engineering conditions. Metamict minerals are a class of natural amorphous materials which were initially crystalline. The mechanism for the transition from crystalline to amorphous structure is not clearly understood but the progressive overlap of recoil nuclei collision cascades from α-decay of uranium, thorium and daughter products is critical to the process. The changes in chemical and physical properties of metamict minerals, actinides doped materials and ion-beam-induced amorphization materials have been extensively investigated, stimulated in part by applications of ceramics in the nuclear industry use as single-phase or multiphase crystalline nuclear waste forms. For example, because Pu can readily substitute for Zr in the zircon sturcture, zircon is a proposed host phase for excess weapons plutonium and monazite CePO4 is a suggested waste form for high-level nuclear waste. This paper summarizes the part of pertinent literature on metamictization and immobilization of nuclear high-level waste (HLW) in a solid form. This paper presents results of geoelectrical research conducted in summer 1998 in Nowa Wioska Dolomite Mine in Siewierz, Poland. Three aspects were connected within this research: geological, hydrogeological and geophysical. The main purpose of these surveys was to investigate the waterflows through the porous massif. Another aim was to check whether the water flowing from the whole mine to a sump is thrown away outside the depression cone established for this mine or comes back to the mine and is pumped out again. In order to trace the path of waterflow, measurements were conducted before and after increasing the mineralization of mine water. This increase of mineralization was gained by adding sodium chloride (NaCl) to the mine water. To gain the best results, the resistivity method, i.e., Vertical Electrical Sounding (VES) in connection with Chemical Tracer Method was chosen. The Schlumberger configuration of electrodes was applied. The mode of this research allowed to compare the resistivity of rock layers measured before and after adding sodium chloride to the mine water and on this basis provided some conclusions concerning the way of waterflows in this mine. It can be supposed that water from the first mine level comes back to the sump on the third level in a short time by the system of pores and fissures in the carbonate massif. Author(s): Król M., Tomaszewska R.
The paper presents results of measurements of seismic wave velocity anisotropy. The results obtained were compared with direct structural measurements. The investigations were carried out in the Triassic carbonate deposits in the NE margin of the Upper Silesian Coal Basin (the USCB). Three areas have been chosen: Strzyżowice, Ujejsce, Strzemieszyce. The velocity of wave propagation was measured in profiles which were radially set, so it was possible to determine the orientation of fracture in the rock mass. The results were estimated on the basis of 2-rank and 4-rank tensors. In the case of strong anisotropy of seismic waves and small numbers of joint sets, there was a good correlation of seismic and structural measurements.